Most novels about the First World War, even those of the home front, portray the emotional and physical carnage, which warp everything they touch. But Mr. Mac and Me takes a gentler approach, setting a coming-of-age story within an unusual friendship between a thirteen-year-old boy and the Scottish artist and architect, Charles Rennie Mackintosh, and his wife, Margaret. The war still penetrates daily life, of course, but remains a thing outside, like a beast scratching at the door. The setup feels vaguely threatening, all to the good, yet misshapen in its odd proportions, which ultimately undermines the novel. 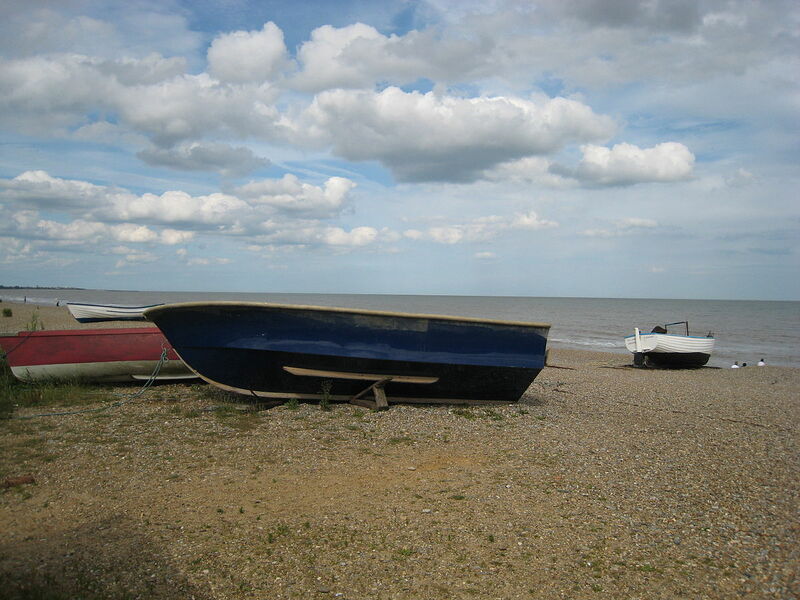 Dunwich seafront, 2007 (Courtesy Wikimedia Commons). The beginning plods, as Freud introduces the Maggs family, which runs a struggling pub in Dunwich, a fishing village on the Sussex coast. But eventually, the story gets going. It’s early summer 1914, and Thomas, the young teenager, has two older sisters and six dead brothers, whose loss he feels keenly. The dead are practically his only company, since his brute drunk of a father is best avoided, and his mother carries too many burdens to pay attention to Tom, unless to cuff him for his misdemeanors. Tom befriends his dead siblings by visiting their graves and adopting a family of starlings as though they represented his brothers alive once more, an example of the sensitive, warm touch that Freud shows throughout. However, he soon has someone else to occupy his vivid imagination. Mackintosh and his wife have taken up residence, and Mac casts a strange figure, striding about the headland and beaches, turning a spyglass on the seascape. At first, Tom thinks Mac must be a detective, for he reminds the boy of Sherlock Holmes. It’s not clear who befriends whom, but the reclusive, troubled architect takes to Tom and encourages his love of drawing–ships, because Tom dreams of going to sea. Margaret, a gifted artist herself, encourages him too and feeds him, having sensed, without ever putting words to it, that he’s neglected. As surrogate parents, they’re a godsend. But come the war, Mac’s behavior creates suspicion in the village. His tramps around the headland, his spyglass, that he’s an outsider, an artist–a “foreigner,” in other words–all count against him. The coastal folk naturally assume that their plot of earth is the first place the Germans would invade, a fear they embrace with the inflated desire to feel important. Is Mac signaling to enemy ships? Tom himself isn’t so sure, because he’s seen Mac and Margaret’s pamphlets describing exhibitions of their works at Vienna, and the German words he can’t read sound ominous. He soon sees his mistake, though, only nobody else does, and his father is among those most strident in slandering Mac. Meanwhile, the more compelling story is about Tom’s growing up. Freud’s Suffolk coast is a place where old ways are dying out, and even Tom’s job with a rope maker may fall to progress. His naivete about certain subjects yields to knowledge, though Freud is careful not to let him see too much. I like the skill with which she handles this, as with the village atmosphere and small moments. The passage of soldiers, billeting in town before shipping to France, teaches Tom a little, and his sister Ann even more, unfortunately. Tom has his first love and catches a glimpse of what the war means, beyond uniforms and patriotic back-slapping. But Mr. Mac and Me never takes flight, mostly because Mac has no voice of his own and never fully emerges. Since he’s not about to tell a thirteen-year-old why he’s depressed–money troubles, career frustrations–Tom has to find this out by steaming open his letters, a betrayal that, disturbingly, hardly registers with the boy. It’s a clumsy authorial device, as with the expository dialogue that Mac spews when he’s particularly angry at the wrongs he’s suffered. The village suspicions, though they have consequences, neither drive the narrative nor resolve it, and the last twenty pages summarize events that deserve a more careful unraveling. Finally, I understand that Freud wanted to focus on the village, but when news comes that a Suffolk regiment has been decimated in battle, the tragedy hardly penetrates, a startling lapse. Mac and Me was nominated for the Walter Scott Prize in historical fiction. The short list includes three books I’ve covered already: The Lie, by Helen Dunmore (October 27, 2014); The Thousand Things, by John Spurling (March 16); and The Wolf’s Mouth, by Adam Foulds (March 12). I’d be happy if Dunmore or Spurling won, but I still think The Lie–my first review on this site–is better. It’s autumn 1941, and a young German soldier is so eager to escape the Russian killing grounds of World War II that he weds a woman he’s never met. This gives Peter the privilege to leave the ranks for ten days, whereas Katharina will receive a pension, if he dies, and the right to call herself a married woman. Surprisingly, the pair take to one another, and when Peter returns to Russia, memories of their brief time together will have to warm them over many cold months. From this bold, startling premise spins a novel in the same vein, spare and unflinching, often as brutal as the war it describes. The way I read The Undertaking, Magee argues that Germans made a marriage of convenience, embracing Nazism out of greed and a temporary advantage that they trusted would be long-lasting. I like novels based on a simple metaphor, and juxtaposing marriage with a hideous, criminal regime is a brilliant concept. Told largely through dialogue, usually in short sentences, Magee’s narrative packs remarkable punch in few words. I liked the group scenes best, especially the tension between Katharina and her parents, which results not from politics–they’re convinced Nazis, all–but from a young woman’s desire to live her own life. 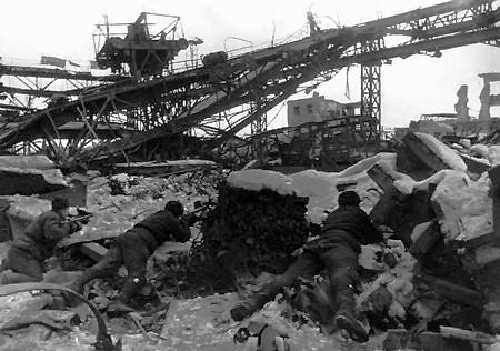 As for Peter and his comrades, it takes awhile for them to emerge as an entity, but some of the later scenes held me, most notably their attempts to help each other survive the battle of Stalingrad. Even so, dialogue-as-narrative can only go so deep. Not even Katharina, whose portrayal is more complete than Peter’s, reveals an inner life. Magee allows them hardly any memories or associations to whatever they experience, nor reflections about what they’ve done. This dissociation appears deliberate on the author’s part. Katharina wears jewelry and dresses stolen from deported Jews, and her family’s new apartment was once occupied by Jews. But she has no feelings about this, not even when she meets a starving Jewish woman in a park. Similarly, Peter helps Dr. Weinart, a friend of his father-in-law’s, to raid Jewish homes and deport the inhabitants, beating them if they don’t move fast enough. Yet he doesn’t think twice about it. He rationalizes nothing; he simply resents the evenings spent away from Katharina. I doubt whether civilian SS officers, as Weinart seems to be, ever led such raids or recruited active soldiers to participate (and they certainly didn’t wear brown uniforms). Nor do I believe how the remarkably ubiquitous, all-powerful Weinart runs Katharina’s family and personifies the entire bureaucracy and social fabric of the Third Reich. For example, no secret police, neighborhood informants, or orchestrated patriotic displays appear, only the evil doctor. But historical fudging or shallow convenience aren’t the greatest flaws; it’s that Weinart’s wealth and promises of advancement have seduced Peter, and we don’t know how or why. Before the war, Peter was a schoolteacher in Darmstadt, like his father, and, up until meeting Weinart, wanted more than anything to resume that career. Why has he changed his mind? I think Magee wants us to believe that he always had his greedy, violent urges, and that marriage gave him an excuse to exercise them. That conclusion fits her central metaphor, but we have only her word for it, not the characters’ thoughts or actions. Are Peter and Katharina meant to be psychopaths? If so, can a person really become psychopathic from mere temptation, as with the flick of a switch? More importantly, no matter how you label Peter and Katharina, how can a reader feel empathy for characters who have none themselves, who act with so little conscience? Doesn’t that violate the purpose of a novel? I have to assume that Peter and Katharina are supposed to represent Germany, yet I sense that Magee’s too perceptive to ascribe genocide and a world war to a simple absence of human feeling. Even so, she offers no other credible explanation; by reducing her main characters to moral and psychological automata, she robs them and their actions of the complexity they deserve. The Undertaking is another nominee for the Walter Scott Prize. It’s a well-written, thought-provoking book, but I wouldn’t put it on the short list. Randall had the look of poverty, grey and small. His body was tightly knit, with jerking reflexes. In his bleak wrists and the clever joints of his fingers, Ray saw Randall’s grip on things. Firing at the range, Randall produced the quick rhythmical chuck-chuck sound of a well-handled weapon. I only wish that the novel lived up to its assets or even followed through on its premise. Instead, the narrative focuses on the back stories of the characters who will meet at a Sicilian village, so that their brief interactions become almost an anticlimax. It’s as if Foulds wants you to forget notions of plot and concentrate on the people, how they got to be where and who they are–predator, prey, or both, depending on the circumstances. That’s an intriguing concept, if a bit heavy-handed and authorial, though I might have gone along for the ride had the characters been better company. Among the Sicilians, the most important are Cirò Albanese, a mafioso who’s returned with the army after having fled the island twenty years before, and Angilù Cassini, a shepherd. I wanted to know them more deeply, especially Cirò, since he’s a mover and shaker and rather repellent–to sense what made him that way, maybe–but he’s more a collection of traditional ideas about blood, power, and money than a real person. The best-drawn character is Will Walker, a British soldier with the occupation army. The jacket describes him as “callow,” but that’s soft soap; Will’s a bigot, a social snob, self-absorbed, supercilious, and always looking to do great things, which can be dangerous for bystanders. 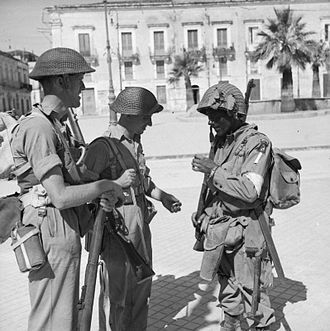 At one point, he decries (to himself) the soldiers who line up with a can of rations, the only payment needed to hire a prostitute on this hungry island. Another day, though, he joins the line, because the young woman is so beautiful, he thinks. But Will’s a complete character, so he has a redeeming trait: an urge to fight back against corruption and treachery. The other character who drew me is Ray, an American soldier unhinged by combat. Foulds captures his sensitive, private nature very well, poignantly demonstrating how soldiers with those qualities suffer intensely in any army. Also, both Ray and Will are short of stature, and since I am too, I was quick to notice how the author figures that into their psychological makeup. Ray feels innately like prey, whereas Will pushes others aside, two faces of the same coin. Will complains that the Americans he meets aren’t real; they’re like film versions of themselves, almost parodies. I wouldn’t go that far, but they don’t seem quite fleshed out, either. Ray, supposedly from New York, could be from any American city where Italian immigrants settled. There’s no particular rhythm or outlook or New York-ness to him, and his speech patterns (as with the other Americans) struck me as generic. So I hope the prize committee passes on In the Wolf’s Mouth. If you’d like to see my review of The Lie, you’ll find it here. The whole list of nominees is here.